Recently a landscape architecture firm did some research on our Docklands Garden Project in Melbourne. We thought you would be interested to have a read about what they had to say! The article is by Jen Lynch a landscape architecture student at the University of Virginia. The research was undertaken as part of a research project on pop-ups by Taylor Cullity Lethlean, a landscape architecture firm. Urban Reforestation is a pop-up vegetable and composting garden at the southern edge of Victoria Harbor in the Docklands. The pop-up is a series of wooden crates surrounded by patterned steel walls, which function as blackboards and are covered with diagrams, instructions, and messages. The pop-up gives the impression of a small community garden that may have arisen through the efforts of a local Docklands group, but it was introduced to the site by Urban Reforestation and is designed to function as a catalytic demonstration garden and education space for sustainable activities throughout the neighbourhood and city. Examples of the activities Urban Reforestation orchestrates include the design and development of community gardens and spaces, balcony garden design, a program for monitoring waste and facilitating composting in the Docklands, training workshops, and community events. The Urban Reforestation pop-up garden introduces a model for the gardening of the Docklands’ vertical residential landscape. It’s an instance of a pop-up serving as a catalyst for more pop-ups—something emergent and dispersed—in the hopes of changing a spatial and behavioural paradigm. The garden succeeds in setting the stage for an emergent garden infrastructure by providing instruction and materials, and Urban Reforestation situates itself successfully among the various organizations around the city, both formal (planners, developers, universities) and informal (neighbourhood communities, virtual networks, etc. ), with which it must collaborate to make such an undertaking successful. In this sense, UR is a model for a catalytic, instructional pop-up and provides a sense of how pop-up urban landscapes might emerge through both a design process as well as through collaboration and negotiation with these formal and informal networks. The typology of the garden and the process of gardening provide a lens for understanding how sustainable technologies and behaviours might be aligned with cultural practices and how a more sustainable relationship with ecological processes might be framed through the urban domestic landscape. What remains to be worked out by Urban Reforestation are the spatial and aesthetic qualities that define the pop-up garden it is establishing as a model and the means by which an identification with that model—via branding—is established. Founded by Emily Ballantyne-Brodie in 2009, Urban Reforestation emerged out of a collaboration at Monash University, Future Canvas, which was started in 2007. The group, representing a range of academic backgrounds, conducted research and collectively worked to establish an ideological foundation and language for addressing the questions: “What is sustainability? How can it be made tangible and everyday?” Emily was specifically interested in how design factored into this type of change. “Sustainable everyday design” is a phrase Emily uses to underscore the fact that design is needed to inspire and facilitate sustainable behaviours. Gardening and composting were the sustainable activities UR decided to explore and the Docklands site was selected as a testing ground for several reasons: While the site has a strong sense of place, the Docklands’ residential developments have very short histories, giving them a generic and placeless quality, and these problem have led to a weaker sense of community. 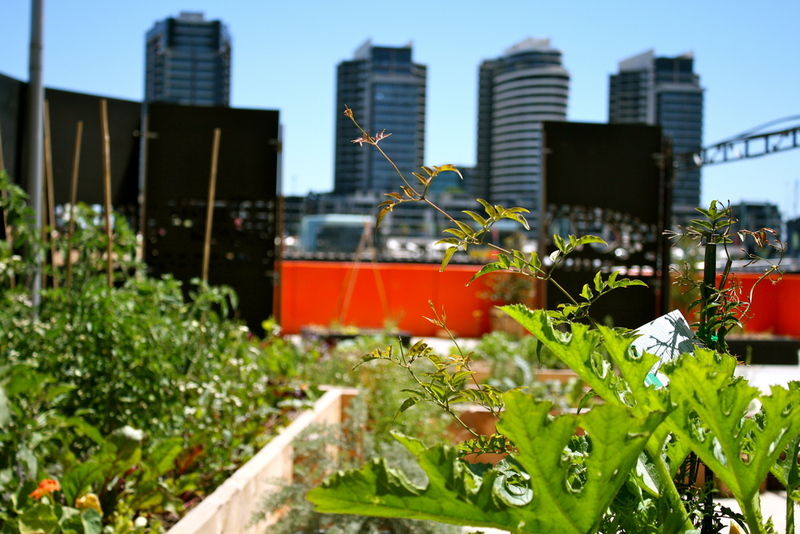 The Docklands, at Melbourne’s periphery, also offered an opening within the urban fabric for testing a garden. While it began as a demonstration garden (a pop-up introduced by Urban Reforestation) vs. a community garden, a community within the Docklands has formed around the pop-up. Now that it has “taken root,” the design permanent for a permanent garden has been drawn up by a set of landscape architecture students through AILA. Precedents for the original pop-up garden were international, ranging from a Vancouver urban farm to projects catalogued through research at the Department of Design and Innovation for Sustainability at Politecnico di Milan (http://www.dis.polimi.it/english/). Urban Reforestation hopes to lay the groundwork of an emergent infrastructure by changing the way resources flow through households in the Docklands and to accomplish this by creating a dispersed network of gardens rather than by implementing a complete, overall system—what we might think of as landscape urbanism. This emergence is facilitated with a set of components—vetted gardening technologies/tools—and through education—by providing knowledge about the processes the project hopes to catalyze. The original Docklands pop-up is meant to function as the nexus within this emergent network of pop-ups, which UR imagines could colonize the city. Urban Reforestation must manage the network of gardens it creates through various means (monitoring, collaborations with institutions and corporations, the orchestration of an events calendar, a communications campaign, etc.). The two main types of collaboration it must undertake are “top-down” (partnering with building managers, Monash University, the City of Melbourne) as well as “bottom up” (assembling a team of official volunteers and orchestrating a series of ongoing workshops and a calendar of events that provide the “glue” of the community and keeping the momentum of project). The larger-scale, more bureaucratic success of the garden depends on quantitative metrics of evaluation. Those quantitative terms help UR earn funding and support. The more “grass roots” dimensions of the garden network need to be reinforced by the events, workshops, etc. staged by Urban Reforestation. The “glue” tying this infrastructure, or network, together, in other words, is very black and white but also very informal. These informal networks can be made virtually (through social network) or anonymously (badges advertising the garden, identifying person wearing the logo with Urban Reforestation, etc.) and so are not necessarily spatial. Urban Reforestation has undertaken a communications campaign, getting word out about the garden on various fronts: its blog, facebook, advertisements, docklandstv.com.au, films, a photo exhibit, garden installations/demonstrations, etc. Despite the success of these techniques, Emily believes the project needs a spatial, localized expression as well as a calendar of events to ground the virtual community that has formed. The design language of the garden (forms, materials, scales, composition) strikes a strong contrast with its context—its crates, buckets, boats, chalkboards, lawn furniture and signage don’t match the architectural language of the site’s buildings; in fact, they throw that contrast into sharper relief. This language was intentionally chosen create a sense of distinction between the architecture on site and the garden. To Emily, the garden is symbolic of nature. The forms, patterns and materials of the garden’s architecture are meant to represent elements of nature (the patterned walls of the garden, designed by Damian Melotte, for instance, are “ecoresonant”—abstracted, magnified wood cells). The garden design also works with scales, spatial compositions and materials which, Emily says, are identified with “home.” The garden’s quality of enclosure, its finer grain and smaller scale, and the material warmth, olfactory qualities, and texture of its materials (food, herbs, wood) are meant to mimic those qualities. In this sense, rather than bringing the language of the Docklands architecture (which is perceived as antithetical to or incompatible with nature) into the garden, the garden tries to set up a new language (representing nature) in opposition to what surrounds it. In a discussion on Urban Reforestation’s website of “beauty and sustainable design,” the aesthetic of the garden, as a landscape typology, is described as one wavering between chaos and order, reflecting change over time through shared maintenance. The aesthetic of the garden, by this definition, then, is not a stylistic or representational aesthetic, involving a specific set of materials or a static representation of nature. It is an aesthetic defined by its unique temporality, flux and shared authorship. In designing and installing prototypes, which design language might be considered strategic, when the aim is to integrate a dispersed network of garden interventions that can be “any place” throughout the city? The balcony gardens in one of the Docklands’ towers that have materialized through Urban Reforestation’s efforts are visible from the garden below, demonstrating how verticality, glass/steel and plants might be meshed without the addition of wood, ecoresonant patterns, etc. The garden is a landscape type that has classically blurred the distinction between inside and outside, house and nature (domestic and ecological processes), not drawn a harder line between the two. The ecoresonant walls and wooden crates, while beautiful, may represent more than blur that line at the moment. Emily’s main concern with the garden is an aesthetic one—How can the identity of Urban Reforestation, as a place and more abstractly, as a brand, be finer tuned to resonate with the audiences UR is hoping to reach, especially as the group tries to scale up and tackle different domestic landscapes and architectural contexts, like the suburbs? If the aesthetic of the garden demonstrated how the architecture of the Docklands might be hybridized with processes of food production, composting, and the aesthetic experience of caring for plants within a setting of glass and steel, it might be more successful in challenging a paradigm of where “nature” belongs in the city and how the garden might find a place. As part of a collaboration with the Victorian Government's Sustainability Fund, Target 3088, Urban Reforestation has organized a waste reduction project for the Docklands. Part of this project involves a process of self-evaluation by Urban Reforestation of the project’s success. This takes the form of monitoring and audits—changes in amounts of waste produced in the Docklands are tracked and these numbers are shared with Docklands residents in the community’s monthly newsletter. At the same time, Urban Reforestation states, “We aren’t approaching the problem of excessive waste being sent to landfill from a strictly scientific standpoint. Rather, we believe that it is by developing the lifestyle behind such behaviour, as well as a sense of community, that will be the greatest driver in such behaviour change.” In further considering the “top-down”/formal and “bottom-up”/informal/grassroots scales that must be addressed in catalysing a network of pop-ups, it’s worth considering how sustainable processes, like composting, are measured and monitored quantitatively, as well as the ways in which their implementation must have aesthetic and the social resonance to affect behavioural change—through identification with others, with actions, and with place. Ecosystem services are often used to establish metrics for the performance of projects, but run the risk of quantifying or overlooking qualities of place that are less tangible. In considering how the process of research/monitoring may be coupled with an exploration of the (more intangible) behavioural qualities of gardening as an aesthetic and ethical experience, Urban Reforestation, as a case study, has seen importance in both. The quantitative data they’ve assembled has led to a certain type of support (funding) while the aesthetic performance of the site has contributed to a sense of place and identity and the generation of community. The key, Emily says, is to combine them, or, given the metaphor she uses, to blur the distinction perceived between the two. She uses the analogy of the village well to describe how something like a garden might be perceived as an infrastructure as well as an aesthetic experience and engage a process of identification. The village well is a place-making site as much as it is a place for the function of gathering water, and it generates a set of practices that are social and cultural as much as they technical. The compost bin model Urban Reforestation has experimented with is an example, perhaps, of how this typology might be translated into a contemporary urban context. How could a compost bin generate a culture around waste, by revealing how the compost feeds the soil, turns into vegetables? - Leadership is required for an undertaking like this—“emergence” requires a catalyst—instruction, materials—and momentum—communications, a calendar of event. UR is not waiting for sustainable behaviours to self-organize. Is self-organization an illusion? Is there always a leader?